Chickenpox is that very irritating red-spot condition that affects everyone. It is one of the infectious condition caused by a virus of the herpes group. This is like one of the troublesome illness that every person has to go through and it usually occurs during childhood. A person usually gets chickenpox when he is young. This is not a serious condition which takes at most 2 weeks for the symptoms to be visible. It would be a lot tougher for babies as it will be very irritating and the baby becomes very cranky. Your baby usually becomes infectious from the second day before the rash is visible and this goes on until they all dry up. In other words, the virus can still infect someone else who hasn’t got it throughout the entire course. How does a baby get chickenpox? As chickenpox is highly infectious, a person can easily get it from a carrier. This can be easily obtained through close contact or just anyone sneezing. In some cases, being in the same room would be sufficient to spread the virus. However, this does not mean that only a chickenpox carrier will infect another. People with shingles could spread the virus as well because it comes from the same source. A person who has chickenpox will start with the symptoms mentioned. Then, the rash will start to appear a few days later. This is different from the type of rash from allergies. Red spots will start to develop and they have some form of tiny blisters. In most cases, the rash will start to appear and will then spread to other parts of the body very quickly. They usually start from the face. One of the biggest challenges with babies when it comes to chicken pox is that they will naturally scratch the itch. 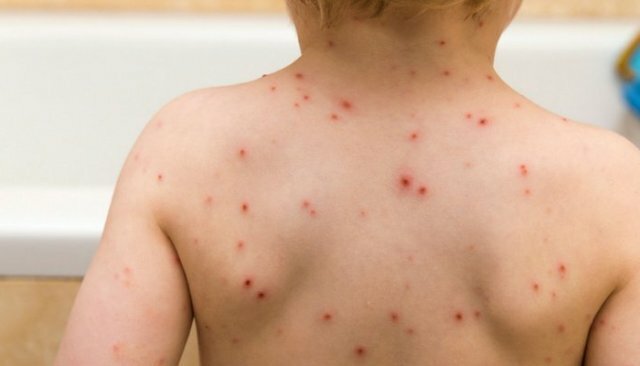 You would need to take your baby to the doctor if you see the symptoms of chickenpox so that the doctor can determine if it is really chickenpox or just a mild skin condition. IMPORTANT! If your baby is less than 4 weeks old, it can be serious and could cause complications. If you see symptoms or in contact with anyone with chickenpox, then you should bring him to the doctor. Basically, there is no direct medication for chickenpox. You can only allow it to go away on its own. This means that you can only try to relieve the symptoms. Paracetamol will help to reduce the baby’s body temperature. This needs to be done according to the doctor’s prescription. Meanwhile, you need to use calamine lotion to ease the itch. Meanwhile, give your baby a lot of water to solve the dehydration problem.